18ct White Gold. 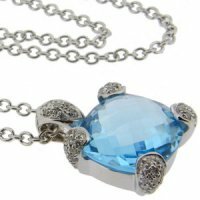 A Blue Topaz and Pave Diamond Pendant. A vibrant briolette pendant set to the centre with a Blue Topaz, cushion shaped and set within 4 pave diamond set claws to a diamond set loop. The diamonds weigh 0.27cts in total. All mounted in 18kt gold. 18CT - 750. Also available in 18ct Yellow Gold. This pendant is available with a two to three week delivery. 18 carat gold. A Blue Topaz and Diamond Ring.